Click on the “Browse” button and navigate to the downloaded “oilean.zip” file and click Install Now. After Installation , Click Activate. 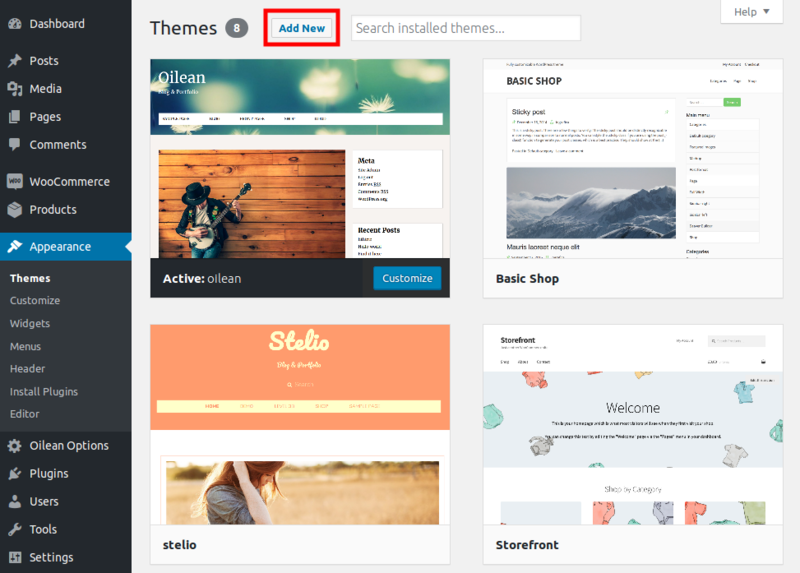 Manual installation of Extension is another option to install Extension to your WordPress-environment. 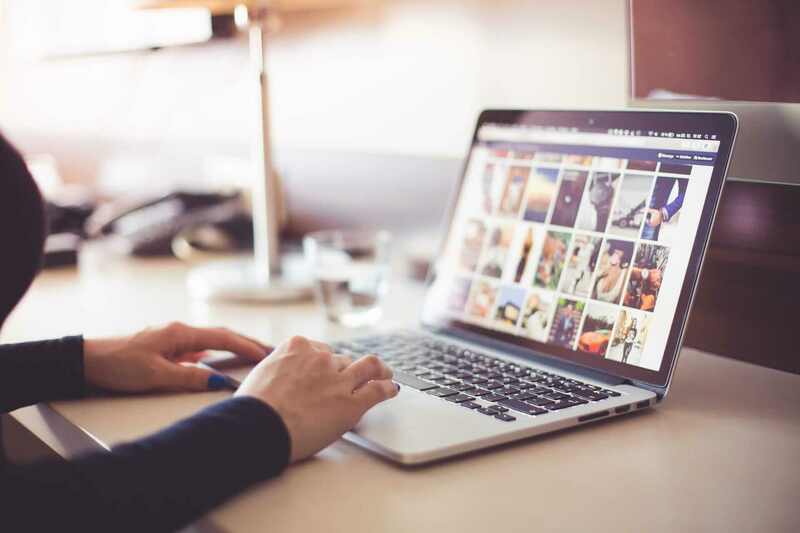 The manual installation method involves downloading our WordPress Extension and uploading it to your webserver via your favorite FTP application. 1. Extract the downloaded “oilean.zip” file. 2. 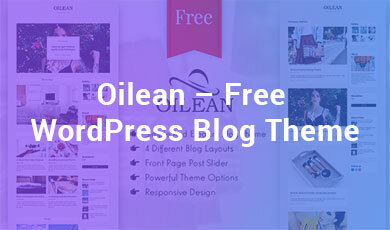 Upload the Oilean.zip folder to the /wp-content/themes/ directory. We have include the exported XML file from our demo, this allows you to quickly set up your theme the same way our demo is set up. Please note, the XML file does not include images or the slider data. Instructions on how to do this are below. 1.The XML file is included within the download package which will be used to import the content (minus slider setup). To configure slider, read the documentation. 2. Navigate to WP Admin -> Tools -> Import. 3.  Select and install WordPress importer. 4. Select the XML file and upload it. It will in few minutes install and upload all content with images. 5. 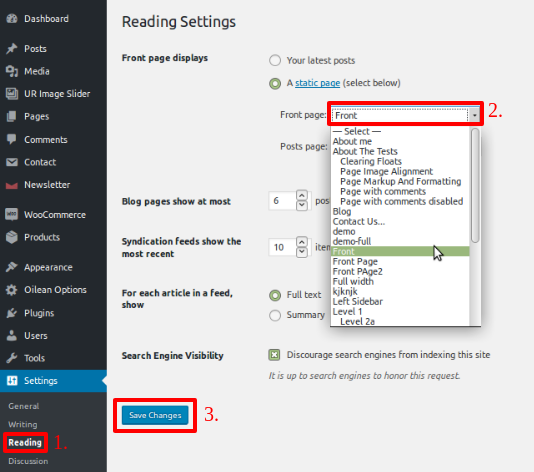 Next, navigate to WP Admin -> Settings -> Reading Settings and set a front Page. If you are using a page with a complex magazine layout you create the page, assign the template “Frontpage” .Then go to Settings > Reading and set the frontpage to static. Select the page you just created from the dropdown. For Frontpage Setting Click Here. 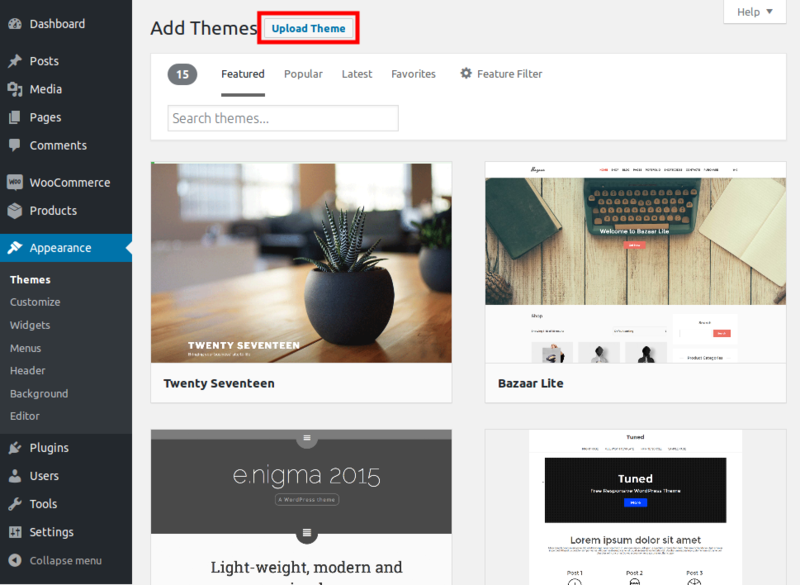 in this Setting,you can add Widgets that provide an easy way to add functionality to predefined areas of your theme templates. 1. Navigate to Appearance Menu. 2. Click on the Widgets Submenu. 3. A Window will be opened from where you can add your widgets. Added Widgets will be appeared in the left or right section of the screen. Added Widgets will be appeared in the Footer Section. 1.Select the widget and then click Add a Widget. 2.Click on Save and publish. 3. After clicking save and publish widget will added to your settings. In General Setting section you can change the site title name, Site description, Header Image, Logo image and Favicon icon of the theme. Change the settings and click on Save Button. 1. Layout Wrapper Option : With this option you can choose either of the two Layouts (Full-width or Box-Layout).This Layout Option provides you to customize the Width of wrapper of theme content. 2. 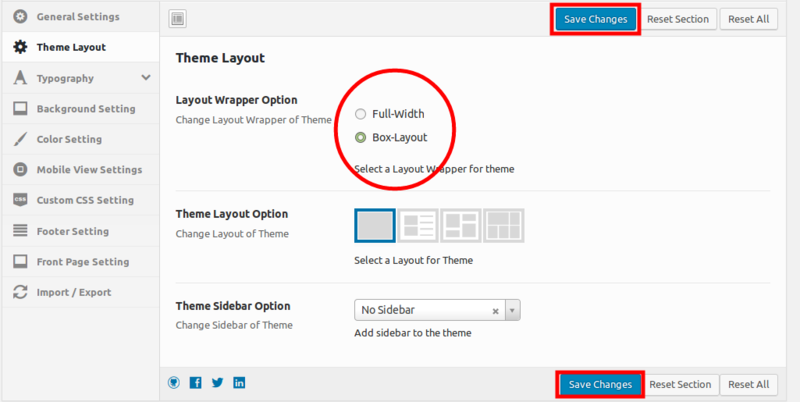 Theme Layout Option: In this option you can select either of the 4 layout options which are Single Post, Side Thumbnail, Masonry and Grid Layout. 3. Theme Sidebar Option: Select one of the options from this settings( Left, Right and No Sidebar). Here we can select the Side Thumbnail layout and select the Left Sidebar option. Here we can select the Masonry layout and select the Right Sidebar option. Here we can select the Grid layout and select the No Sidebar option. 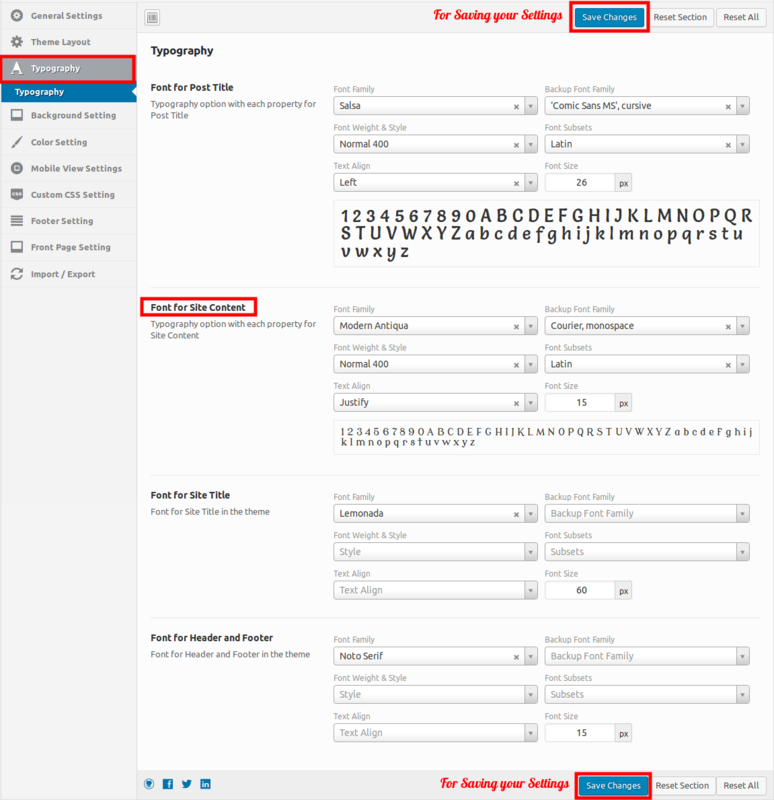 Font for Post Title: In this setting you can set the Font Family, Font Weight & Style, Text Align, Backup Font Family, Font Subsets and Font Size. 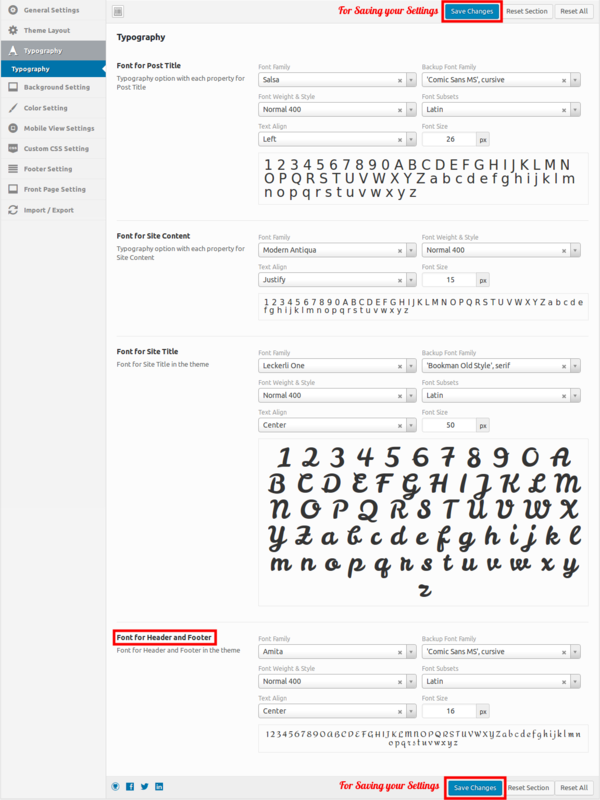 Font for Site Content: In this setting you can change the Font Family, Text Align, Font Weight & Style and Font Size. Font for Site Title: Here you can set the Font Family, Font Weight & Style, Text Align, Backup Font Family, Font Subsets and Font Size. 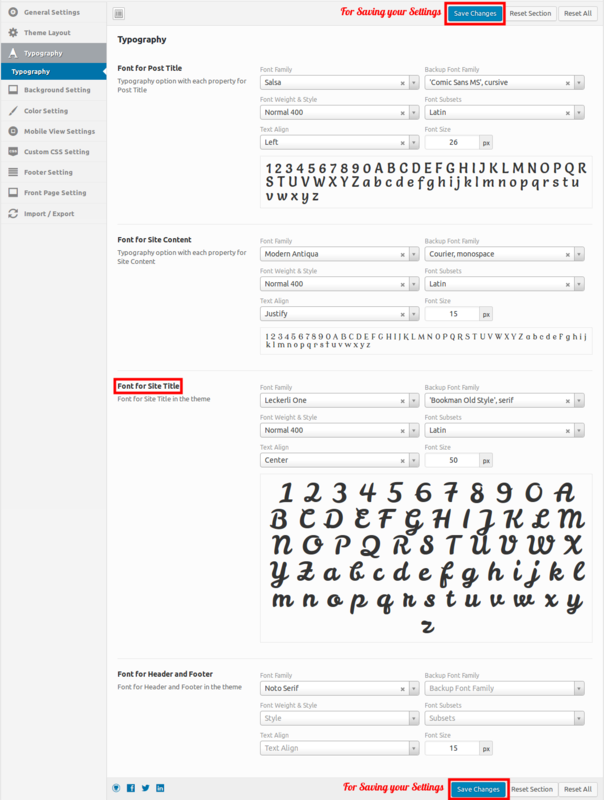 Font for Header and Footer: In this setting you can change the Font Family, Font Weight & Style, Text Align, Backup Font Family, Font Subsets and Font Size. 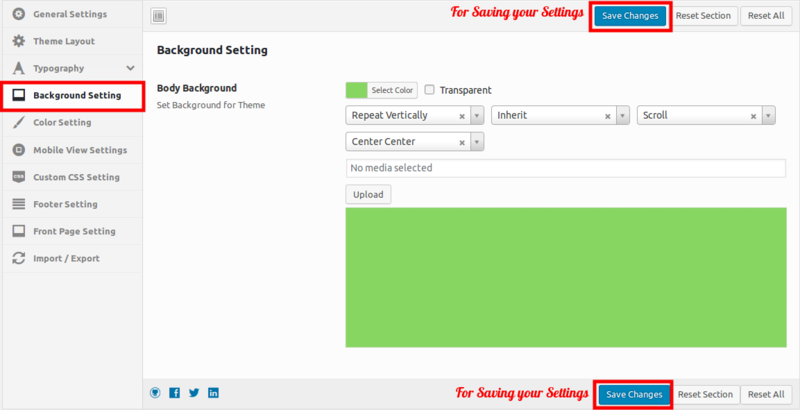 In this setting you can set the theme background color and click on the Save Changes button. 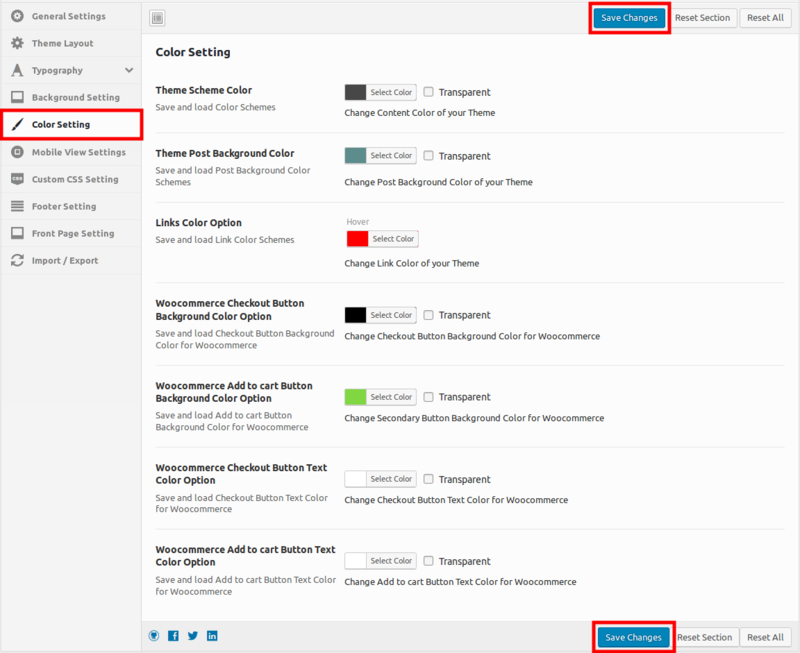 In this setting you can change the theme content color, Post Background Color, Link Color, Checkout Button Background Color, Secondary Button Background Color, Checkout Button Text Color and Add to cart button text color. 1. Set width of Menu for Toggle: In this section you can set the width of menu for toggle. 2. Sidebar in Mobile View: Here you can enable and disable the widgets in mobile view. Custom CSS styles provides you to override the Theme default styles. 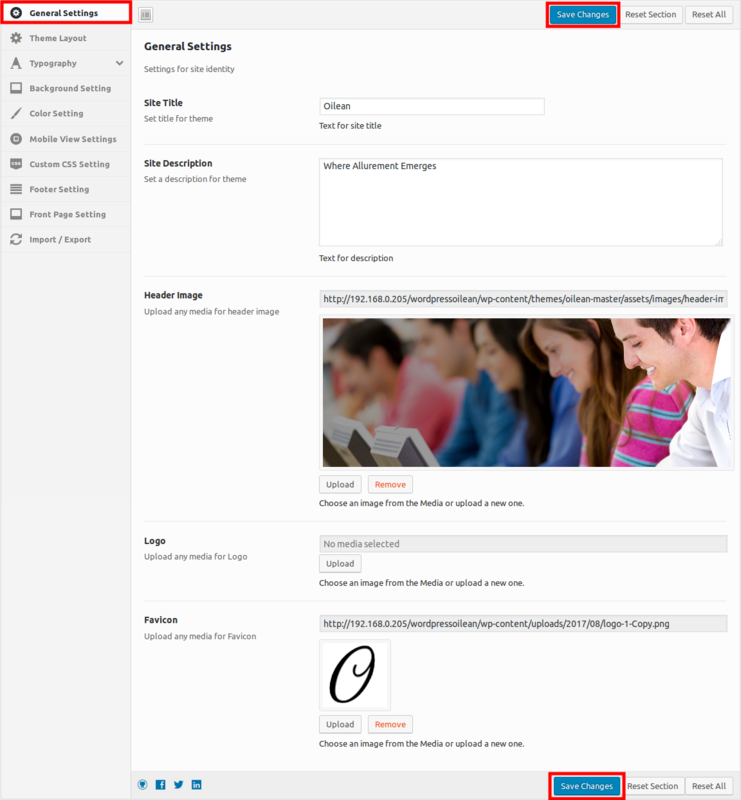 This Theme is designed to meet the needs of administrators who would like to add their own CSS to their WordPress website. 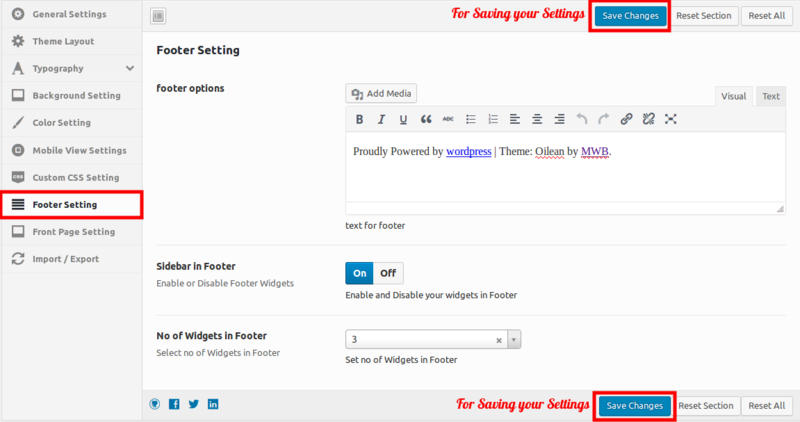 In this setting you can change the footer content, Enable and Disable the footer widgets and also set the number of widgets in footer. 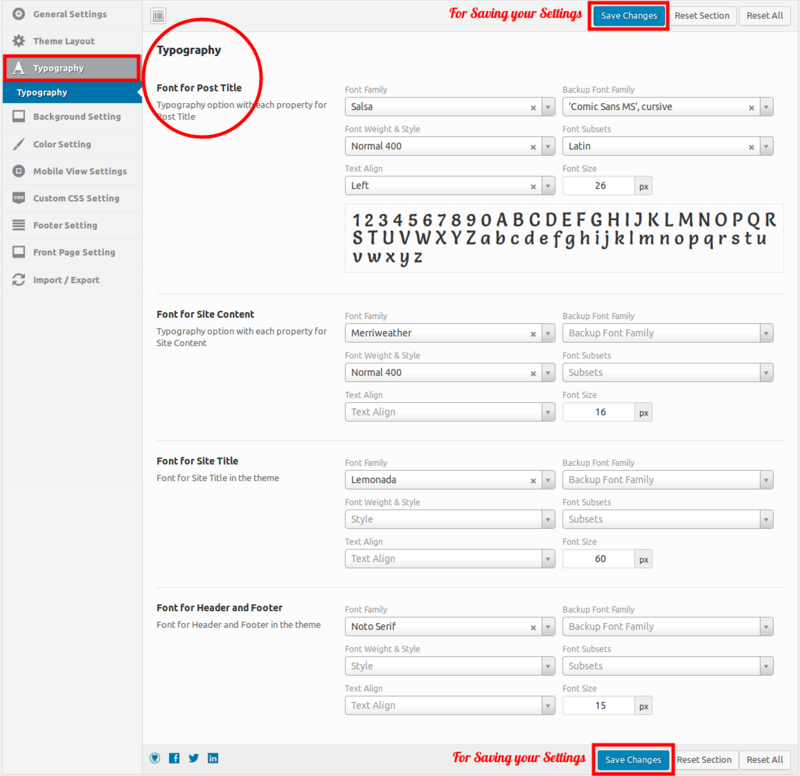 In this setting you can choose the category for front page slider and set the number of post for slider of front page. 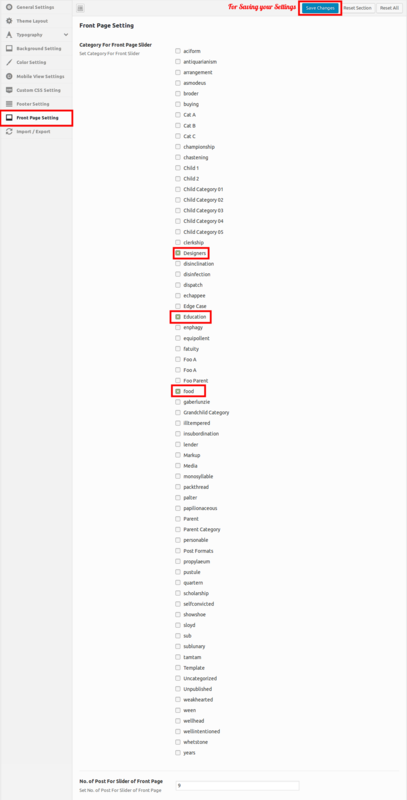 Here you can select the category, number for top section of front page and you can also select the category, number for middle section of front page post. Open Poedit and go to File > New catalog from POT file and select the POT in Oilean > languages folder.